Leading up to our first international tour, well almost for 6-7 months prior to our June arrival, I told Molly Jay (tuba) and Troy Conn (guitar) that I would be wearing the biggest smile when we all met up on 2 June at London King’s Cross. With nearly nine months of organizing, fundraising, making a album (partially finished), arranging tuba sponsorship (Wessex Tubas), reaching out to friends and family across the UK for support, The Fat Face Band was willing and ready to take on the United Kingdom. I myself had arrived one week prior to perform several concerts with two groups, RPE Duo and Space F!ght, with my longtime friend and electro-man Dr. Radek Rudnicki, and many other musicians including Tom Adams, Dr. Enrico Bertelli, Anna Edgington, James Mainwaring, and the extremely gifted visual artist Jakub Hader. As mentioned, months of planning for this tour and all of a sudden we are standing together, the trio, in London, what a great feeling. Quickly we departed to spend one evening with our fantastic host Raphael Clarkson (trombonist in WSP and many other bands). For the night we had a nice meal at a local curry house then settled in for the first of our secondary tour plan, the sampling of many great British ales. 3 June: Train to York and a birthday party! Fat Face arrives in my home away from home where I lived from 2007-2010 studying for my PhD at University of York. First stop, the Maltings for a quick half pint. Our gracious hosts for the duration of our York stay was Dr. Rudnicki, his partner Weronika Czarniecka and the rest of the their housemates. We had a great BBQ celebrating Jakub Hader’s (visual artist) birthday with many friends stopping by. Later in the evening we all headed to town to stop by a few pubs (The Last Drop, Trembling Madness…etc..), visited our friend Constantine the Great outside of the York Minster, then found our way home late, probably too late. Probably one of our few rainy days, Fat Face packed up all the gear and headed for a early afternoon workshop at University of York arranged by staff member Liz Haddon. With a group of twelve students, we embarked to spread our quirky ways with the students having trumpets play bass lines, drummers play chords, and singers beatbox. Unique groups were formed (cello, double guitars, and trumpet for instance), performing some of our own original music (concentrating mainly on Molly Jay’s fantastic suite “Pharaoh’s Love”). The students were willing and excepting of anything we threw at them, but this is what one should expect coming from University of York, a department that embraces and celebrates eclecticism in music. The evening found us at one of my favorite venues, The Phoenix Inn. We performed for the first hour of the session and then led young and old musicians alike in the second hour for the jam. A packed crowd (and a listening crowd! ), lots of friends again, making us feel welcome and excited for the rest of the tour. It was a pleasure as well to see my former trumpet students (Josh Elcock and Max Galley) participating in the jam and as well heading off to study music at university. Special thanks also goes out to James Lancaster (the organizer of the jam) and Al Morrison (for lending us an amp for the tour). Fat Face wrapped it up early this evening but what a start to the tour! Why come all of this way and not do a little sightseeing? So, Fat Face headed into York for a day of sightseeing with a fantastic tour guide (yours truly). Of course those that have had the pleasure of visiting York know all of its charms! Troy and I, the fearless drivers of the tour, headed to York Rail Station to pick up for Skoda Estate auto for the tour. Molly quickly nicknamed the vehicle John Skoda, after a fantastic Charlotte-based bassist named John Schigoda. Heading off to the Dales, the Fat Face had a special guest photographer for the day with Jakub Hader. In the previous week I had visited Malham with some friends and organized a super special secret gig for the Fat Face Band. As part of our team-building regimen, the trio spent the day on a nice walk hitting all the classic sights (Janet’s Foss, Gordale Scar, and of course Malham Cove), it may have been a little cheeky of me but I made a point to visit a area that I had been so many times with friends and family. After a nice walk and a meal, The Fat Face Band performed at a charming pub called The Buck Inn (thanks to Sue and John Oakley for having us). We met some very nice folks, played for a few hours, then headed back to York. Today was the final day in York and time for our tour to commence. In the morning I woke up early to enjoy one final bicycle ride into town, another beautiful and sunny day made it quite bittersweet to leave my old home. I was able to visit with my wife’s great uncle, Douglas Petty (aged 91, RAF veteran), who still is in tip-top shape. I had seen him earlier in the visit, but it was great to have some more time to hang out with him. Heading to Leeds, we went straight to our venue (HEART) where we met up with our great friends Kim Macari and Riley Stone-Lonergan who were also are gracious hosts for the evening. Kim, my wife Gwen and I spent a lot of time together playing and on holidays at her cottage outside of Elgin. Kim, who is heading up Apollo Jazz Network, helped our band book some of our shows along the UK tour. Our concert in Leeds was as well part of the Headingley Music Festival. Again we were quite overwhelmed with such a great turnout and another listening audience. We played two strong sets, performing our original pieces, some old standards, a few Americana-inspired tunes, and even a Beatles song (“I’ll Follow The Sun”). After our concert, with the help of Lesley Jefferies, we were able to unload some Fat Face merchandise to our audience and then head off to Riley and Kim’s place for the evening. It was so delightful to have a good visit with our hosts before tucking in for the night. 8-9 June: Robin Hood’s Bay! Another classic destination on the tour, the wonderful village of Robin Hood’s Bay! I was feeling slightly nervous that our arrival would be delayed due to the whole of England heading to the coast to get a good burn, fortunately we made good time and were able to enjoy a little relaxation prior to our concert at the Ye Dolphin. Our event was part of the Robin Hood’s Bay Folk Weekend and we were quite enthusiastic to listen to the other bands as well. Leading up to our performance, we sat in the Ye Dolphin and listened to several solo folk artists and as well a folk jam session where the audience collectively sang several songs. We had heard that the folk crowd may not have liked a jazz trio but we tailored our performance, playing several Americana/folk songs along with a few jazz standards. In the end, we had another warm and delightful audience whom were very appreciative of our concert. Our last day off on the tour before a long strand of gigs found us in a small village called Osmotherley in the North Yorkshire Moors. We stayed at a nice YHA that was an old linen mill, met a group of cyclists going coast to coast, and had a great time at The Queen Catherine pub. Troy and I found one of our favorite ales on the tour in the Thwaites Lancaster Bomber. Departing Osmotherley and heading southward to Sheffield, we were recharged and ready for a great concert at The Lescar in Sheffield as part of their weekly jazz concert series. Arriving in to Sheffield, we checked in at a quirky B&B called Heavenly Nights. After settling in, our trio headed to downtown Sheffield for a good walk and explore prior to the show. Departing to the show, we had our first hiccup leaving behind a few items at the B&B. Luckily we had plenty of time to sort ourselves out. The venue was very nice, a nice little stage, just big enough for the trio and a great listening audience for our two sets. We were quite pleased to have the freedom to perform some of our “avant-garde” compositions for the audience, intertwining them with jazz standards and folk tunes. So a early morning off to Wales for an afternoon concert at the Wales Millennium Centre in Cardiff. Lucked out on the weather again and came in with time to spare before our concert. The staff and audience at WMC treated us wonderfully and I was fortunate to have some of my wife’s Welsh family in the audience. Our concert was rebroadcasted on YouTube, which was nice to view after the tour finished. That evening we had a radio interview led by Rhys Phillips on Radio Cardiff. We were able to discuss our tour and as well play a few tunes. A beautiful day awaited us and we were able to not only visit the city centre but as well take a detour to a favorite location, Caerphilly Castle. The band packed up from Cardiff and headed to Abergavenny to perform as part of the Black Mountain Jazz Series arranged by Mike Skilton. Abergavenny was quite a nice little market town and we were treated to a very appreciative audience at Hoffi Coffi, I coffee bar turned jazz club in the evening. That night we were hosted by a lovely lady named Ruth who took in three American jazzers for quick night’s rest. Our longest journey (except for the US to UK flight) found us driving six hours to the seaside town of Berwick-upon-Tweed on the northeast coast. The Barrels Ale House had suggested we play a pre-match (England v. Italy) Fat Face gig, we thought it sounded like a great idea! Playing down in the caverns of the Ale House, in small venue, we performed to a warm audience who suggested that the TV stay off and we continue to play! Other football fans in the pub were more inclined to watch the match. We were still able to put on a good performance and had a great time meeting several locals. Our penultimate show was at Whigham’s Wine Cellar in the city centre of Edinburgh. Prior to our performance, we were all able to spend some time touring the charming city. Originally we had planned to stay with Kim Macari’s family, but were ready to turn our rental car in, so we stayed in a nice B&B near the venue. Our gig was quite a good time, the weekly jam session. Fat Face Band performed the first set and then the final two sets found a mixture of singers, rhythm section players, and the Fat Face Band. We enjoyed a late night out in Edinburgh after the gig. We dropped off the rental car at Edinburgh Waverley, hopped on a train to London (16 June) with a closely timed amp handoff in York (thanks Al Morrison!) and we were back to our friend Raphael Clarkson for the next few nights. 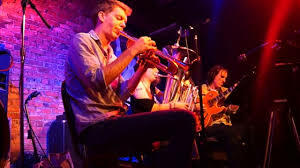 Our final gig was held at the Vortex Jazz Club where upon my last visit I saw Mr. Kenny Wheeler and his quartet a few years ago (currently listening to Wheeler’s Tribute on BBC Jazz Radio). We played with a fantastic London-based band Fumi Okiji’s Old Time Band for our final performance and soaked in the wonderful vibe at the Vortex. Our tour wrapped up and it was quite remarkable to imagine the amount of shows we performed in a whirlwind trip around the UK. We had marvelous support from so many friends, family, venues, arts bodies, tuba sponsors…. etc.… Not to mention all of the local support back in Charlotte, North Carolina. As I wrap up this blog three months later, the tour will be a great memory for myself and hopefully for Troy and Molly, the two most wonderful musicians to experience a tour with. Someday we can hope to tour again and we are now planning some exciting events for the rest of the year and in 2015.